You elves work hard! You toil all day and all night leading up to Christmas, just to make the all the fabulous toys for the kids-- some of whom, let’s face it, just squeaked by onto the “Nice” list this year. Right? This ensemble, then, is for the elf who knows the key to happiness: if you work hard, you gotta play hard. 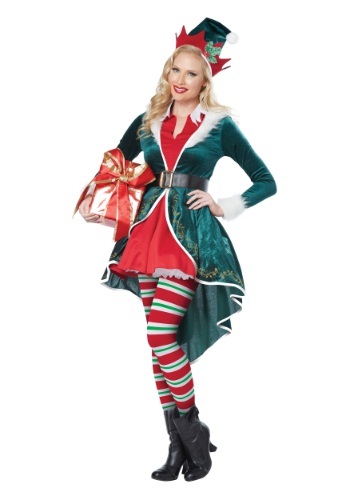 This isn't your ordinary working-in-the-toy-factory elf suit; this is what you wear to the North Pole Christmas party. No one can be productive without a healthy work-life balance, and this costume will help your evening come to life and rejuvenate your exhausted elfy soul. After all, toys aren’t what they used to be! A season’s work used to entail nailing a few wooden blocks together to make a train, or carving a pretty doll out of porcelain. Toys are so high-tech these days, you and your fellow elves have had to sit through a ton of professional development workshops: electrical engineering, IT programming, even a session on hoverboard wiring. Phew! What ever happened to dollhouses, we ask? Your fellow elves will welcome the presence of your eye-catching company after all that holiday labor. And without overtime, no less! Why not inspire the whole crew to dress to the nines, tonight? Then your fancy pullover dress (styled as green velour coat over a red tunic) and striped tights will have met their match! Grab a drink, grab a present for yourself from under the tree and go ahead, be a little elf-centered tonight. We think you’ve earned it, and we tip our velour elf hats to you. I purchased this costume for a work holiday party outfit, but I was unsure if it would fit me or not. I ordered a size XL. I am 5' 11" and 200#. I am a 38H bust and a 16/18 hip/waist. I did not order the crinoline. The quality of the costume was OK. Not stellar, but above average. The fur was solid and did not shed. There were no dangling threads, uneven seams, holes, or bunched areas. The sewing was even and professional and maintained symmetry. The belt was pretty much garbage. The buckle didn't have a pin, so would just slide off the end and would have had to have been stapled or taped together to have been of use. I set it aside and used one of my sons' newer dress belts. The hat was made of the same thin foam that many children's Halloween costumes are made out of. It looked cheap out of the bag, but once it lost its squashed, wrinkled look, it was really cute. I was very surprised to find that the coat and dress were one piece. Although it took awhile for the white collar to lay right, the rest of the coat/dress was good to go out of the bag. The dress was a lot more modest than I thought it would be. The "v" hardly went past my collar bones. It was also a bit tight on top, but there was enough give in the thin velour and polyester that everything got covered without damage to the outfit. The sleeves were too short, but I pushed them up to make them into 3/4 length sleeves and they looked great. I was also pleasantly surprised by subtle gold decoration around the bottom of the coat. It is difficult to see in the pictures, but it really adds a nice touch. The hose are quite cute and are opaque. In no way can you see through them. My only issue is that they are WAY WAY too big. How odd is that? They have an elastic waistband, but the material isn't really elasticized and baggs everywhere from the waist to the thighs to the calves. I could be a 22/24 and wear those hose. I suppose, if I wear them again, I will just wear suspenders under the dress or something. I tried wearing a pair of tight green shorts, but halfway through the night, they gave up, too and gravity started winning the battle. I spent the rest of the evening with one hand under my skirt, holding up my drawers. My suggestion would be to get an alternate set of hose or leggings to wear instead. I really enjoyed wearing this outfit and got many complements on it. I felt pretty and silly and in the holiday spirit all at once.